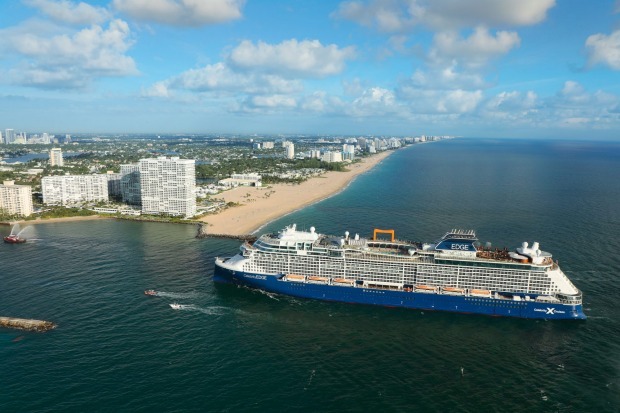 Celebrity Edge arrives in Fort Lauderdale, Florida. 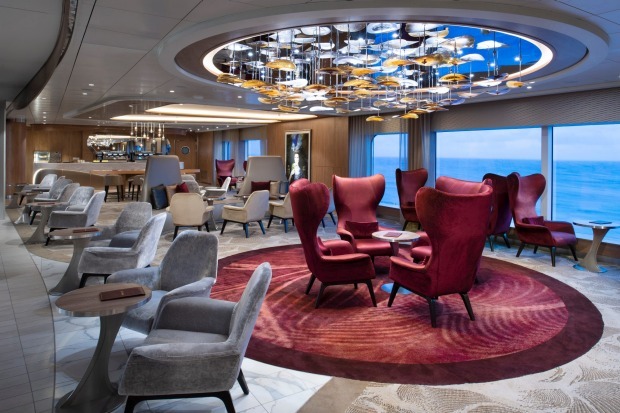 Another innovative new feature of Edge is Magic Carpet, a 90-tonne platform the size of a tennis court that is cantilevered over the ship's starboard side. 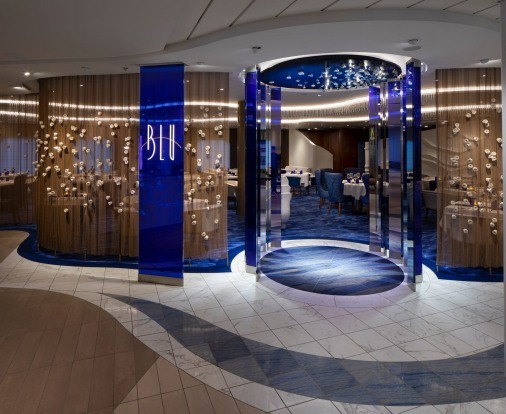 The Blu Restaurant on board. 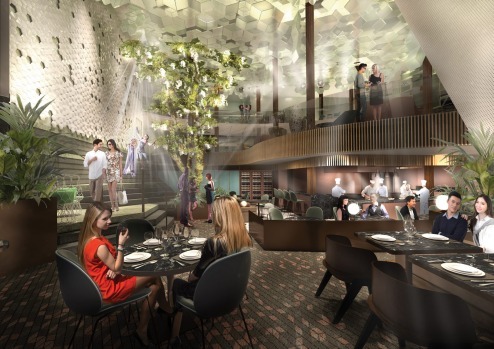 Nearly every restaurant on Edge – and there are nearly a dozen of them – is a new concept. 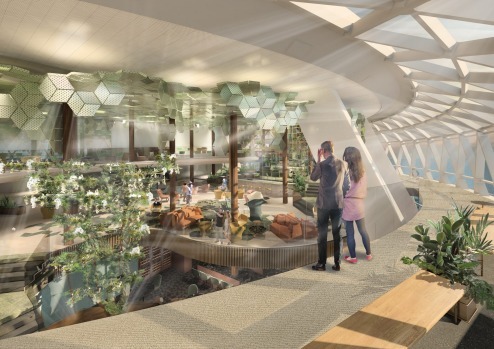 Also noteworthy was the creation of a three-deck-high, plant-filled lounge, dining and entertainment venue at the back of the ship called Eden that is partially encircled in glass. 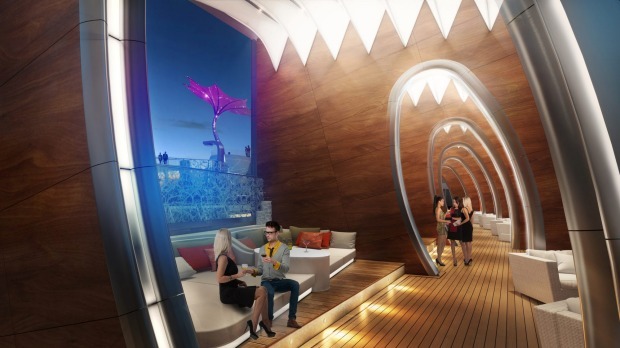 Offering unusually wide-open views of the ocean, it's full of seating nooks facing outward to the sea. 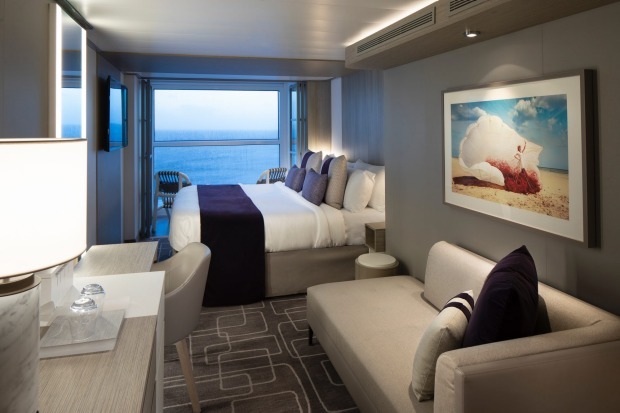 A villa suite on board Celebrity Cruises's new Celebrity Edge ship. 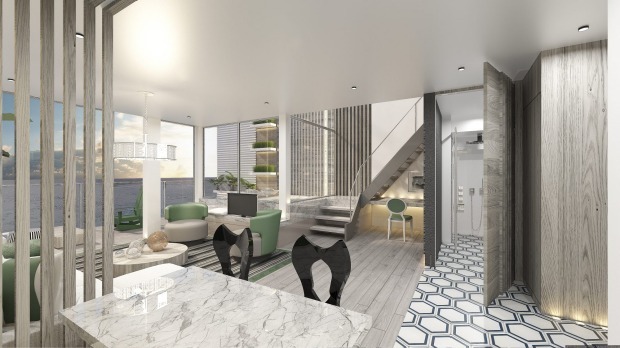 The six double-storey Edge villas are glass boxes offering full ocean views as well as a private plunge pool. 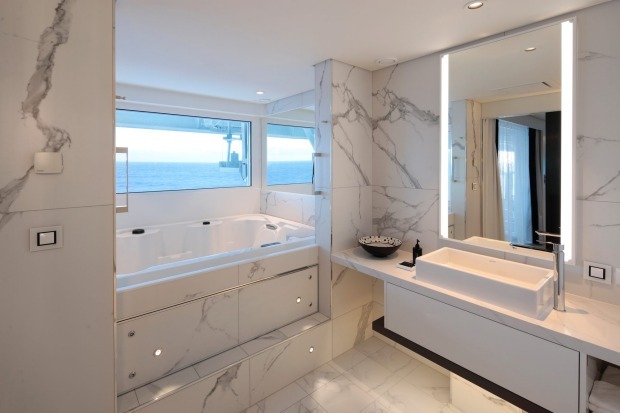 The six double-storey Edge villas are glass boxes offering full ocean views as well as a private plunge pool. 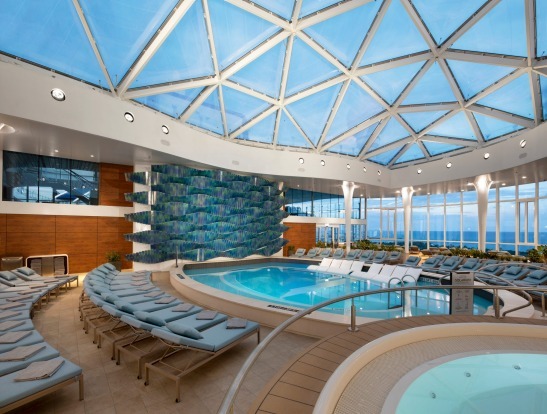 The pool deck on board Celebrity Cruises's new Celebrity Edge ship. 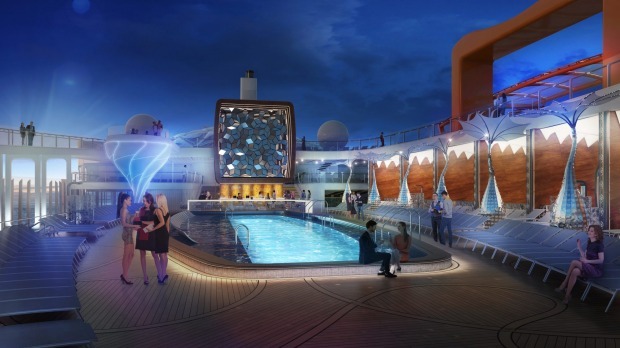 The design for the pool deck on Celebrity Cruises' new Celebrity Edge ship. 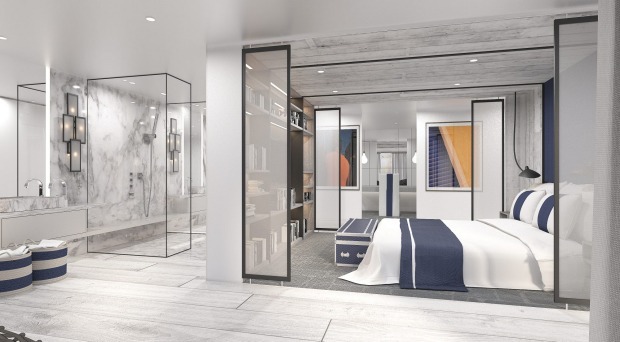 Edge Stateroom with Infinite Verandah on Celebrity Cruises' new Celebrity Edge ship. 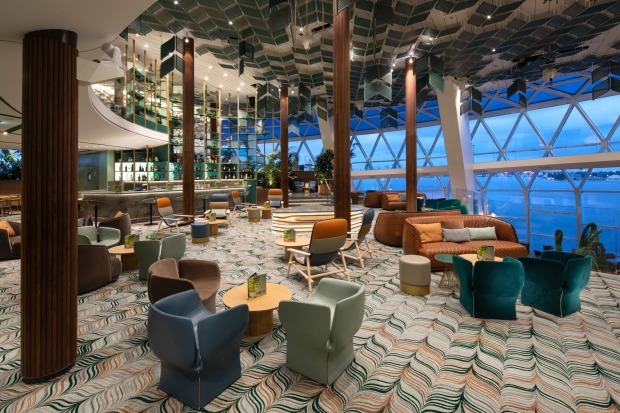 Magic Carpet bar on Celebrity Cruises' new Celebrity Edge ship. 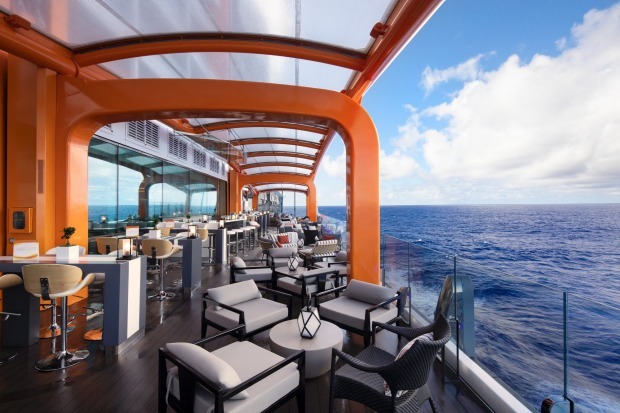 Cabanas on Celebrity Cruises' new Celebrity Edge ship. 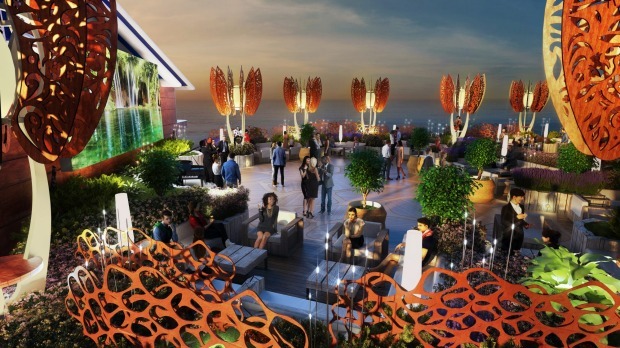 Rooftop garden on Celebrity Cruises' new Celebrity Edge ship. 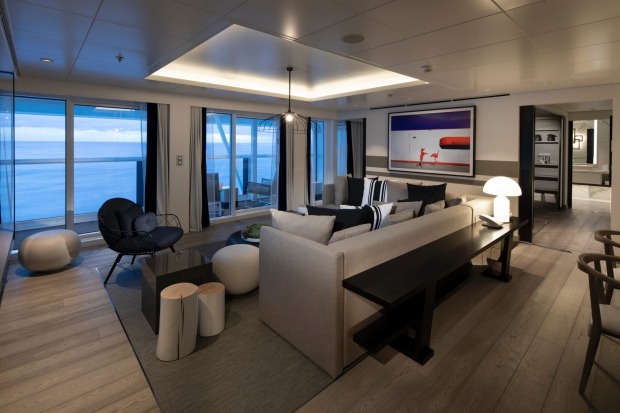 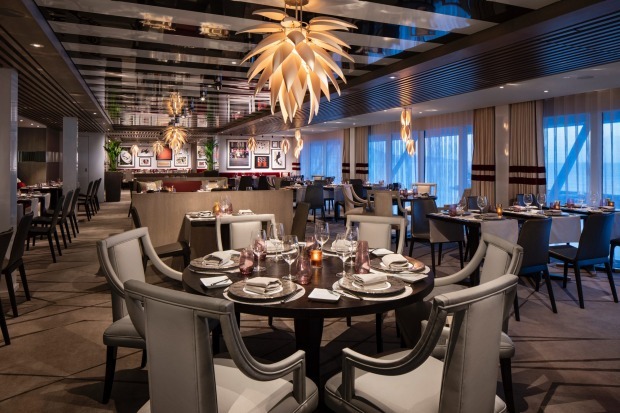 Suite lounge on Celebrity Cruises' new Celebrity Edge ship. 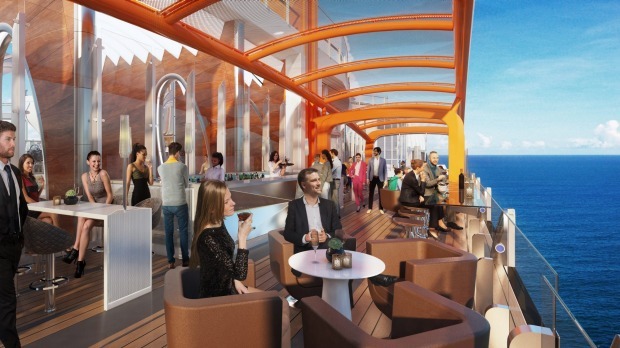 The sundeck on Celebrity Cruises' new Celebrity Edge ship. 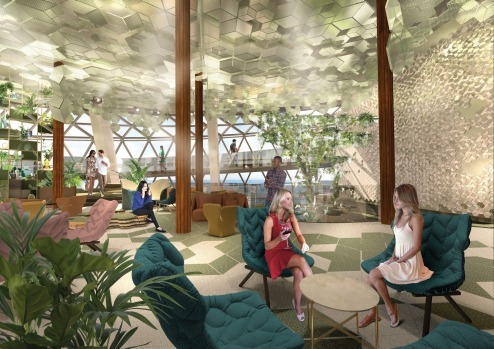 Penthouse on Celebrity Cruises' new Celebrity Edge ship. 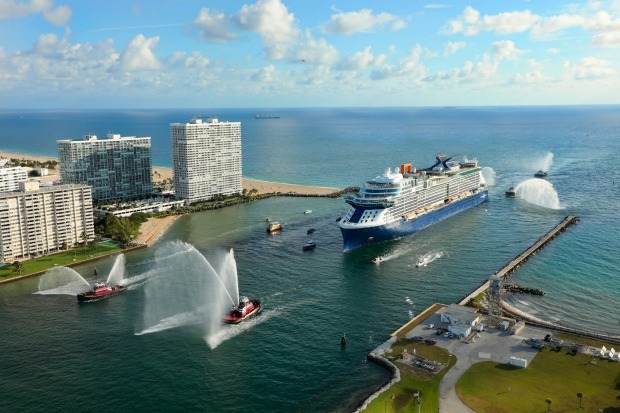 Celebrity Cruises' billion-dollar Celebrity Edge has launched in Florida and sails on its maiden guest voyage on Sunday. 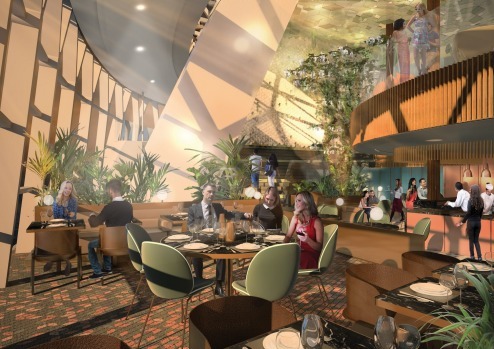 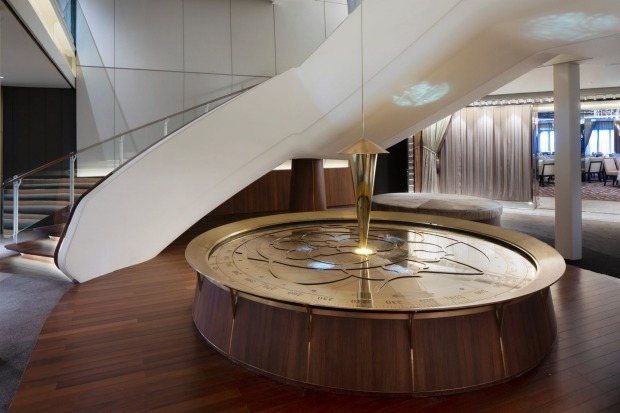 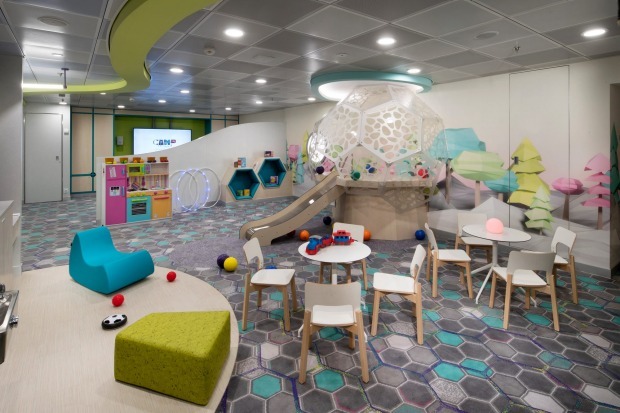 The 2918-passenger ship has a 2000-square-metre spa retreat, rooftop garden, Grand Theatre for entertainment, and 29 food and beverage experiences with menus created by Michelin-starred chef Cornelius Gallagher. 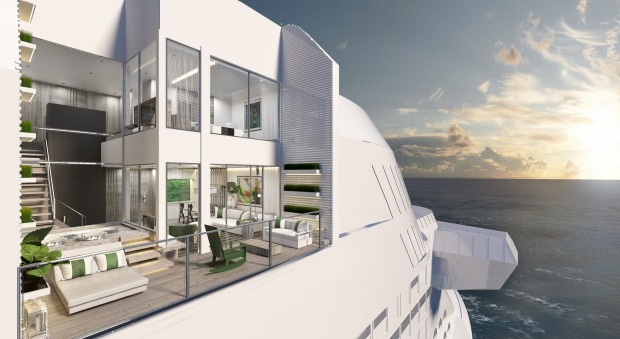 Cabins include split-level Edge villas and two-bedroom penthouse suites. 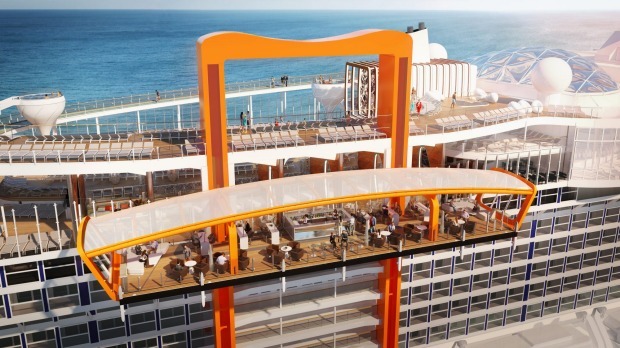 Celebrity Edge begins her inaugural season sailing alternating seven-night eastern and western Caribbean cruise itineraries, followed by a season of Mediterranean cruises. 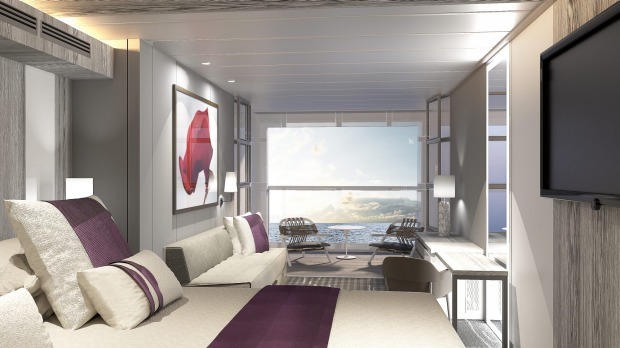 Sister ship Celebrity Apex launches in 2020, and two additional ships in the Edge Series will follow. 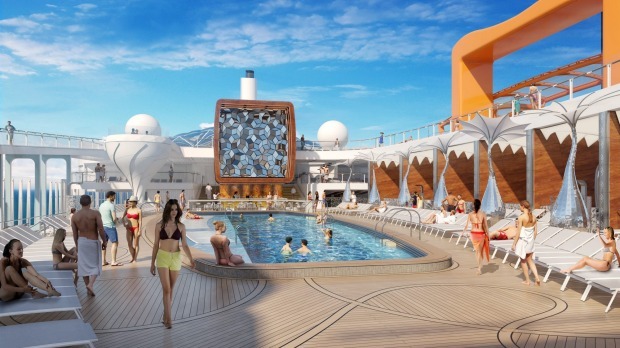 Viking Orion, the newest ship in Viking's ocean fleet, will call Australia home when it begins home-porting here for three months every summer. 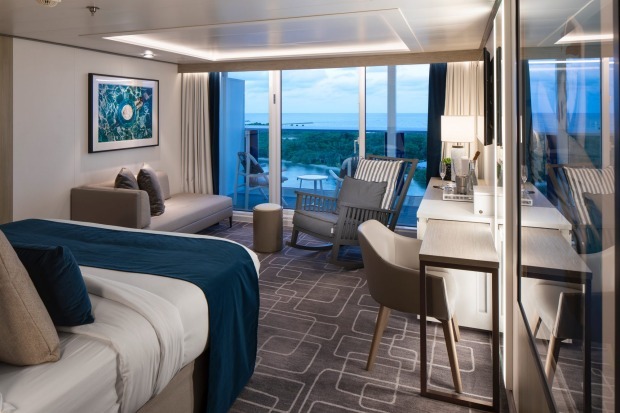 The ship has just arrived in Darwin for its debut season and will spend the next three months sailing between Sydney and Auckland on Viking's new Australia and New Zealand itinerary. 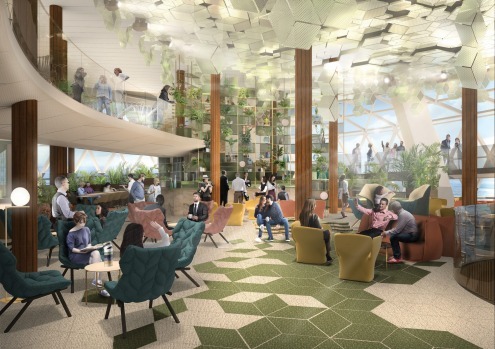 Viking Orion departs Sydney in early March 2019 as it heads back towards Indonesia. 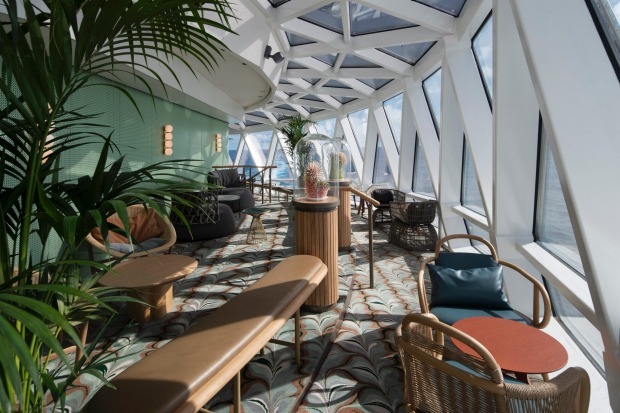 Viking Sun is also visiting Australia in March as part of a 128-day World Cruise itinerary, with stops in Sydney, Hobart, Melbourne and, in a first for Viking, Adelaide and Perth. 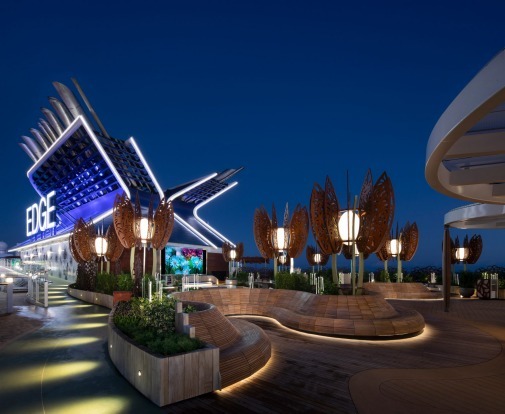 Celebrity Edge begins her inaugural season sailing alternating seven-night eastern and western Caribbean cruise itineraries. 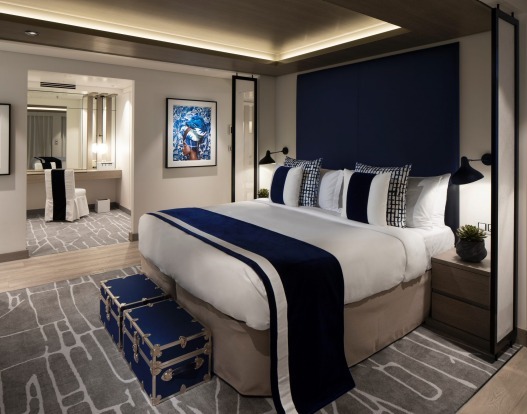 Uniworld has announced that it is adding four new river ships to its fleet over the next few years on the Nile, Douro, Mekong and Volga rivers. 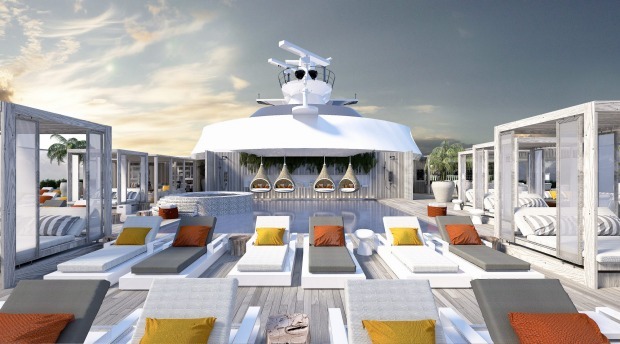 The ships will replace existing vessels and take their comfort and design levels up to the standard of Uniworld's custom-built Super Ships that operate elsewhere in Europe. 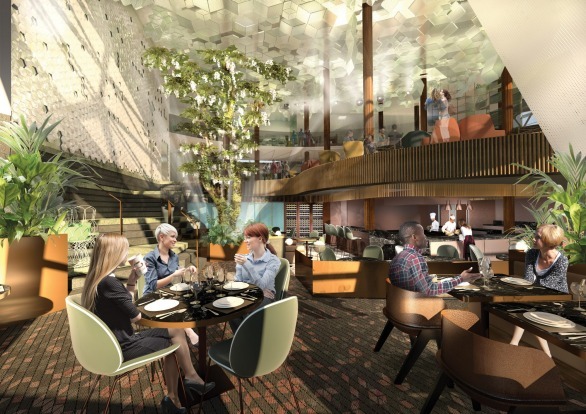 The company is also renovating and upgrading River Countess, which operates on the Venetian Lagoon. 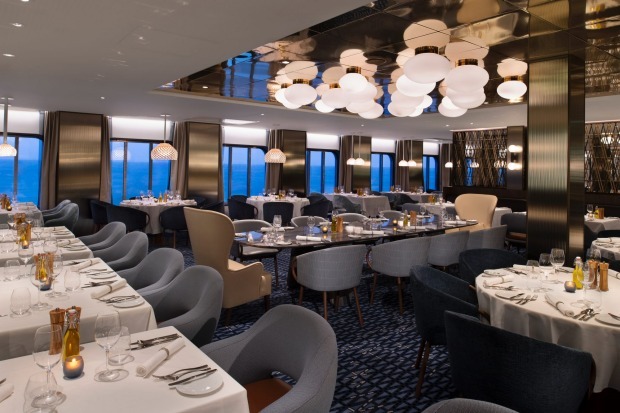 Beatrice underwent a similar overhaul this year, and in early 2019, newly upgraded ship Bon Voyage sets sail in Bordeaux in France. 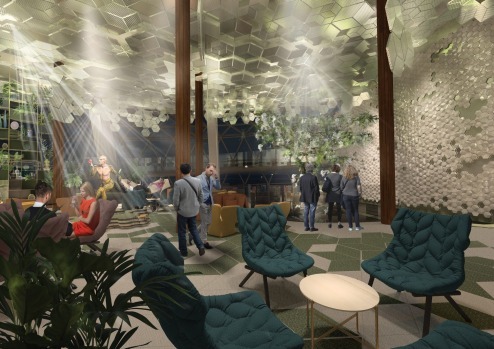 In 2020, Lindbald Expeditions' new polar-class ship National Geographic Endurance embarks on a series of eight inaugural Arctic itineraries. 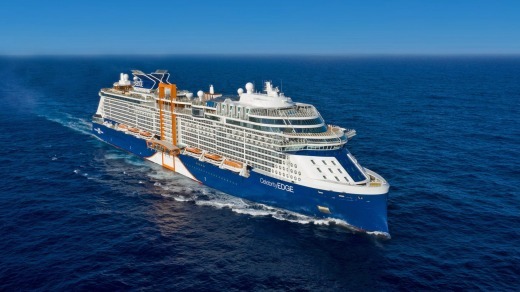 Among them is a Svalbard in Spring voyage to the far northern Norwegian islands known for their large polar bear population, and a Northeast Passage voyage between Norway and Alaska that travels one of the most adventurous routes of the High Arctic, taking in Franz Josef Land, Severnaya Zemlya and the Siberian coast. 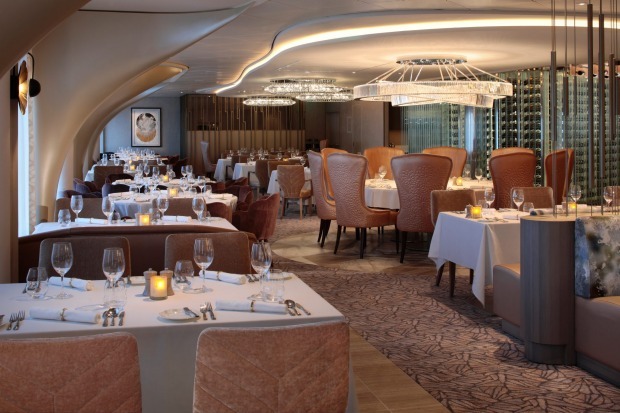 There's also an East Greenland itinerary along its eastern coast and into the world's largest national park, Northeast Greenland National Park. 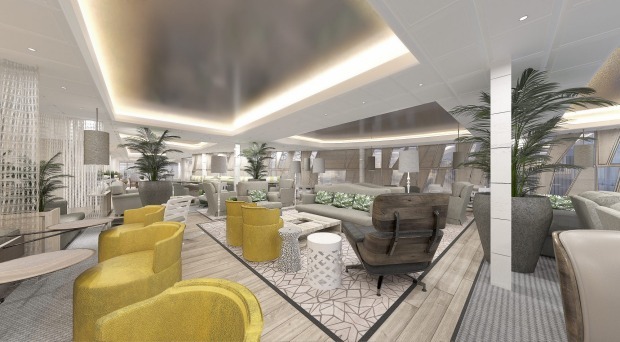 Crystal Cruises has announced one of its most extensive World Cruise journeys ever, with Crystal Serenity setting sail on January 5, 2021, on a 139-day odyssey between Miami and London. 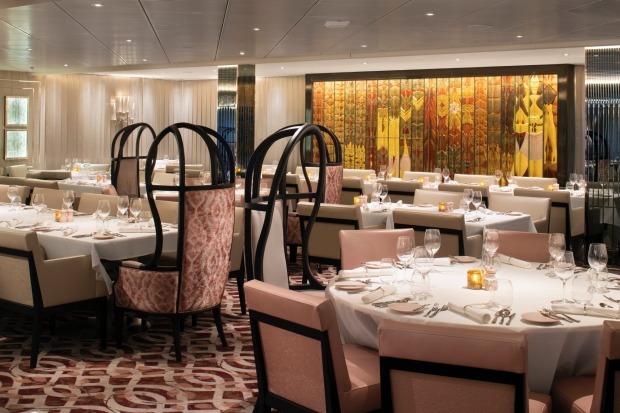 The Ancient Dynasties & World Wonders itinerary sails to the Caribbean, Hawaii and the South Pacific, Australia, south-east Asia, the Far East, India, the UAE and the Mediterranean, and features a transit of the Panama Canal and overnight stays in 17 cities. 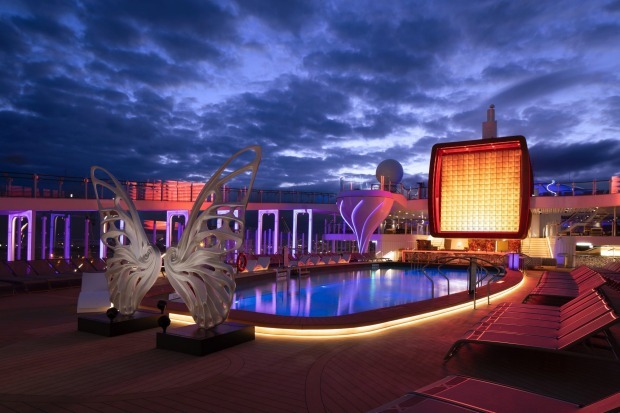 If that's too grand an adventure, the odyssey is also offered in nine segments of between 12 and 21 days.